On The Road Again – The 500,000 Piece LEGO Car Starts Up! This is nothing short of awesome… A “teenage genius from Romania”, Raul Oaida, has built a car which is made entirely out of LEGO and is made of over 500,000 pieces. With the help of Steve Sammartino, an Australian marketer, this wonderful creation has been made so! 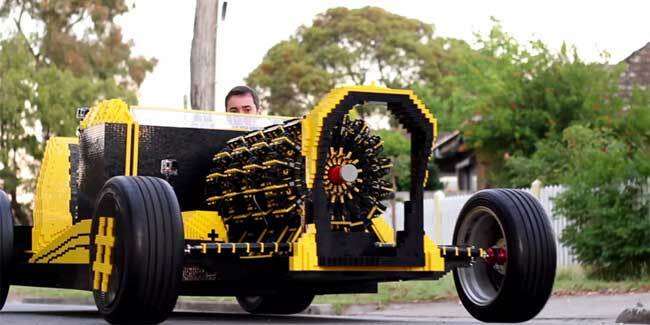 The car is based on a hot rod design and the engine, which is also made of LEGO, runs on compressed air. The only parts which aren’t made of LEGO are the wheels and tyres (of course). The car runs at a speed of 30km/h, and is powered by four orbital engines with a total piston count of 256. You can watch the car in action, on our ‘Exciting Game Trailers’ playlist on YouTube! Aw..love logo, this is awesome.